Well, it may not feel much like spring — high temps here have been in the low 60s — but the plants can sense the lengthening days and the more intense sunlight. 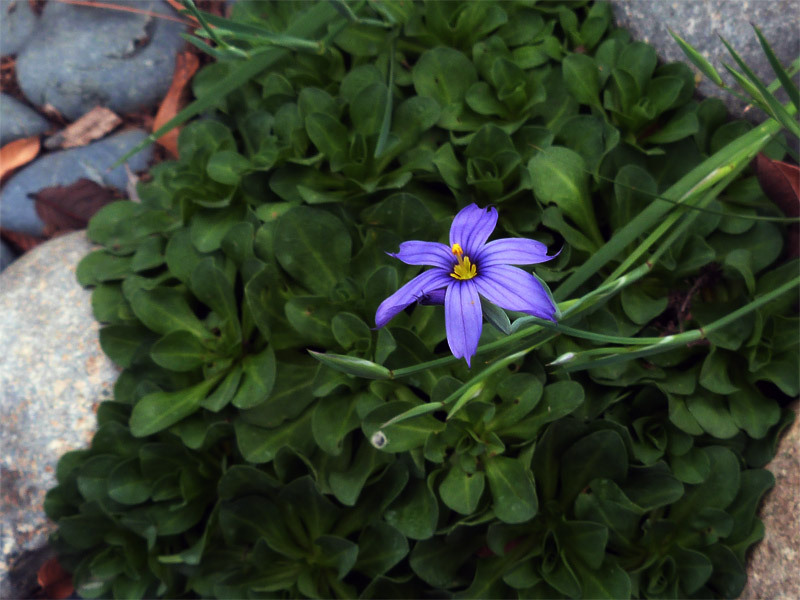 The wildflowers have been sprouting since December, and some are starting to bloom! 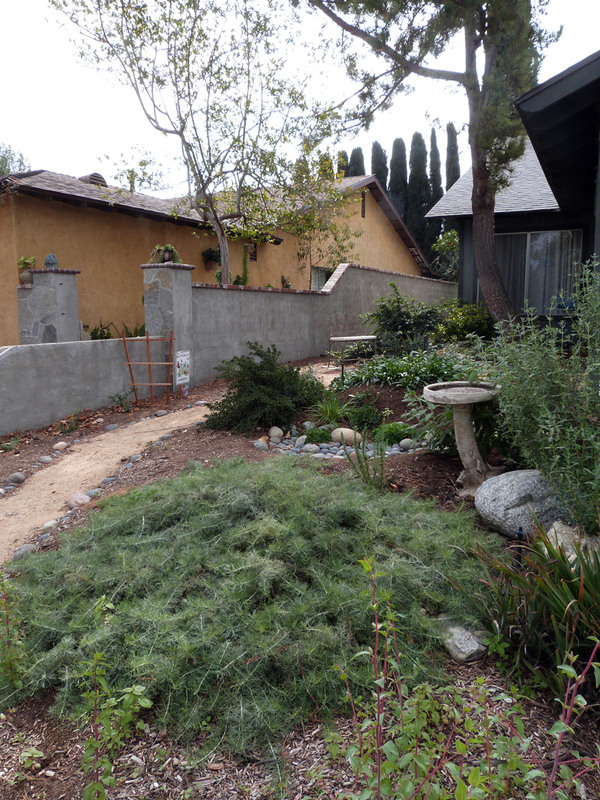 Let me make note of the fact that we are in the midst of a historic drought here in California — in the West in general. We’ve probably had all of four days of rain since November, most of it just drizzle. 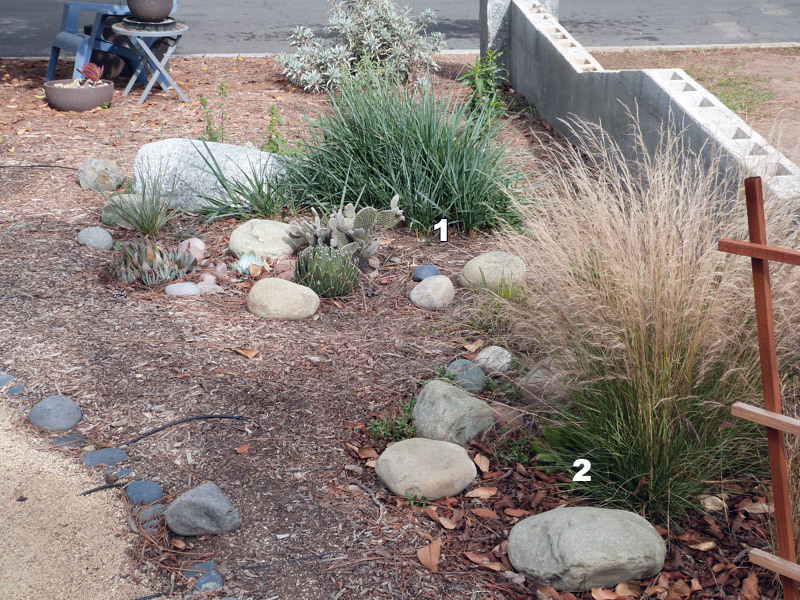 As a result, I’ve continued with my summertime watering regimen throughout the winter — usually, it’s not necessary as soon as the rains “take over”. Not this year. The experts are saying that a drought of this intensity has not been seen in 500 years (using tree ring data)! Needless to say, our agriculture is suffering greatly, and that means the rest of the country will start to feel it pretty soon — so much produce comes from here. Of course, most of our agriculture requires irrigation. There has been a lot of controversy over whether that’s a good idea — should the country be so dependent on farms in a drought-prone area? Nevertheless, agriculture is a huge industry here, and it’s taking a huge hit. Take a moment to spare a thought for our suffering farmers! 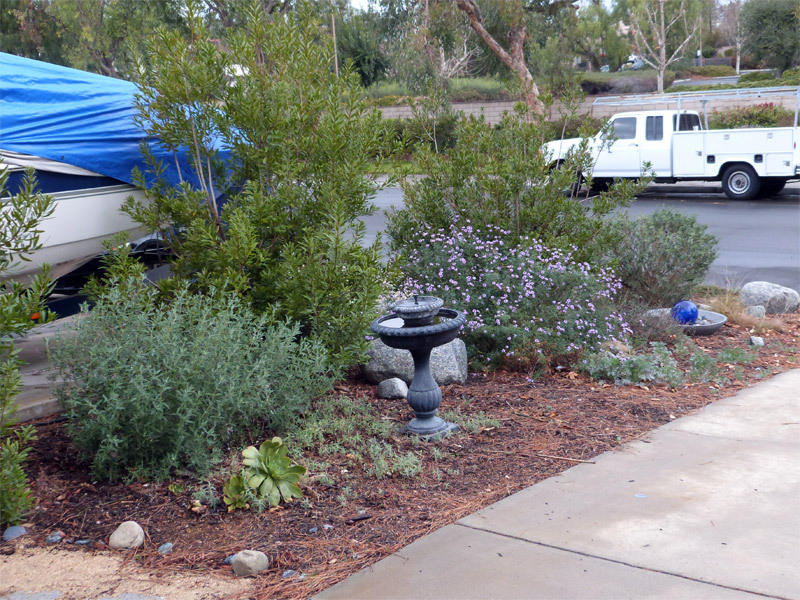 (1) the mass of vegetation that includes Elegant Clarkias, annual Lupines, and the perrenial Scarlet Bugler and Margarita Bop Penstemons I planted last fall. (2) the Allen Chickering Sage that I planted in the spring. I’m a little worried about its anemic growth. Plants grow very little in the summer, but I would expect to see a little more winter growth. I’m concerned it may not have become established — time will tell. (3) the resurgent Canyon Prince Wild Rye in the background. 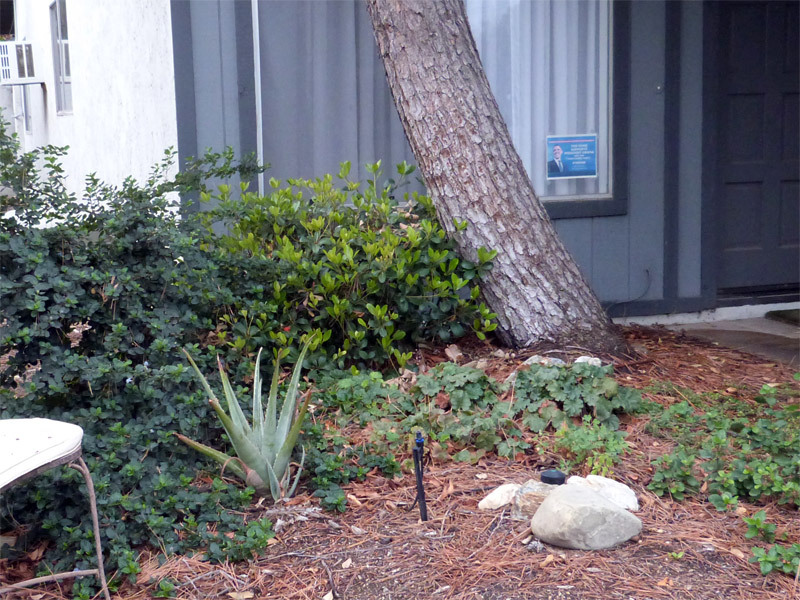 This is a plant that looked ratty and disheveled in the summer, with many brown stems. In the fall, I coppiced it almost to the ground — and look at it now! It looks gorgeous! 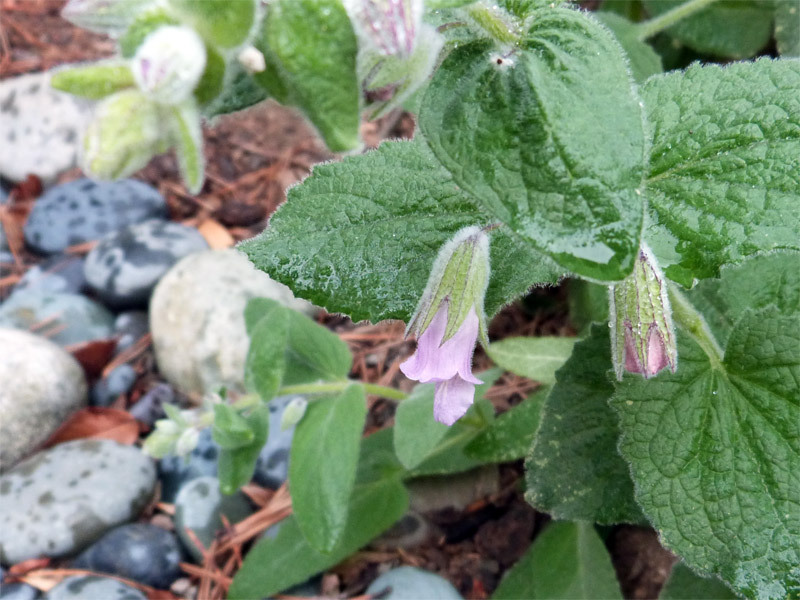 Here’s a clearer picture of the Pitcher Sage and the copious Cleveland Sage. Can’t wait until they come to life with blossoms! 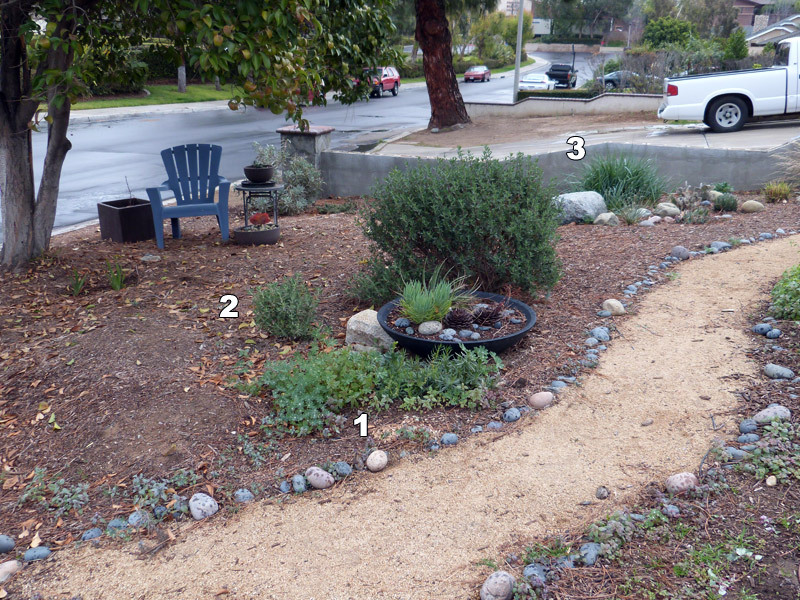 Note here (1) the California Aster, which I pruned in the fall, and is continuing to spread, just the way I was hoping; (2) the Seaside Daisies, which are growing nicely to fill in their respective niches; and (3) the Blue-eyed Grass (Sisyrinchium bellum) that I planted in the fall, and which is growing nicely. It’s even got a few blossoms! 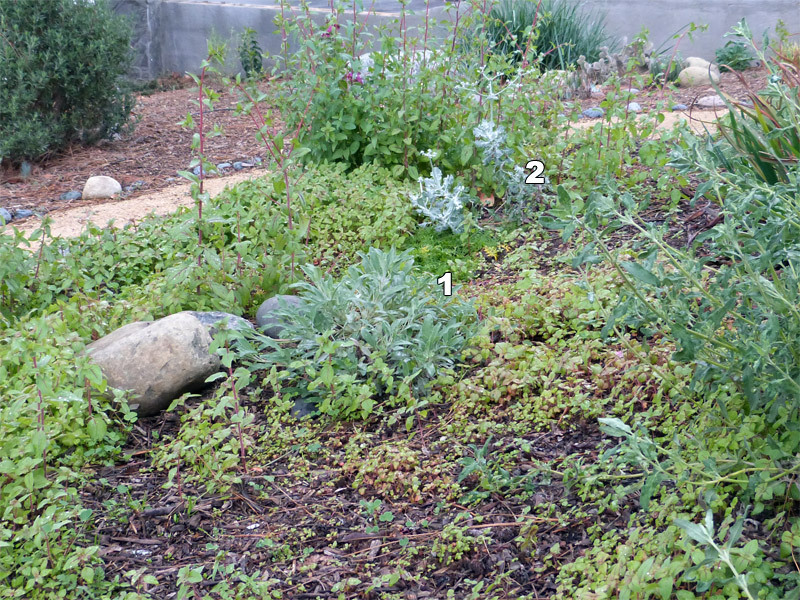 Then there’s the area near the house, consisting of mostly Coral Bells, Evergreen Currant (Ribes viburnifolium), the prostrate Yerba Buena (Satureja douglassii), and a Western Columbine (Aquilegia formosa). A new addition is an Aloe that I transplanted from the area near the Purple Three-Awn grasses — it was being engulfed by them! 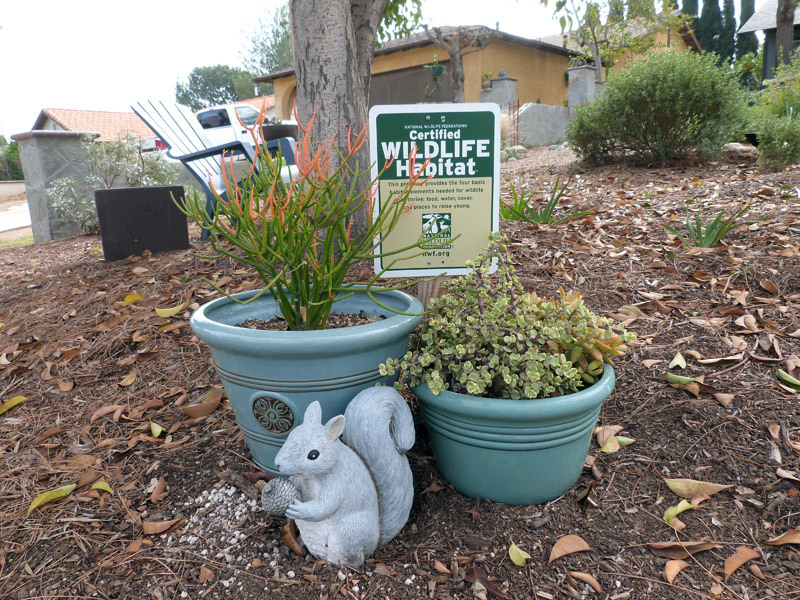 It’s taking the place of the potted Red Monkeyflower that, alas, did not make it. I have to say, I am worried about these milkweeds: they seem very fragile! 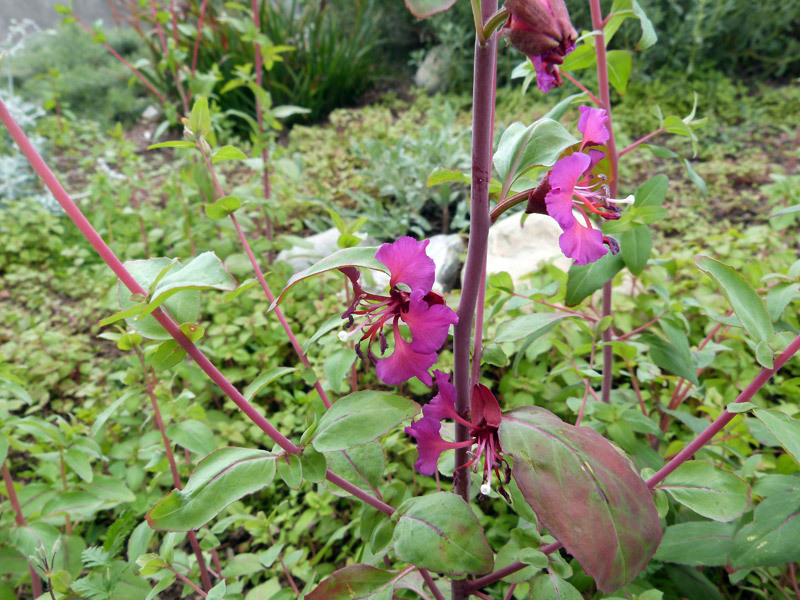 Their stems are weak, and much of each plant is virtually lying on the ground. Will they be able to support a large population of caterpillars? They seem much less robust than the scarlet milkweeds — maybe that’s why most native gardeners have that kind, even though they are not native! I may have to purchase some scarlet milkweeds to “supplement” these native ones. It just seems like a fully mature Monarch caterpillar — even one — would cause one of these narrow-leaf milkweeds to fall over! It’s worth mentioning that a possible reason we are seeing so many Monarch butterflies in these parts is that the eastern strain of the species, the one that overwinters in Mexico, is rapidly disappearing! The conjecture is that the increased use of GMO corn and soy crops that are resistant to the Roundup herbicide — and the consequent increase in the use of that herbicide — is wiping out the milkweed plants in the east and midwest. I don’t know if that is the reason we are getting so many Monarchs here, but I’m suspecting that it might be a factor. 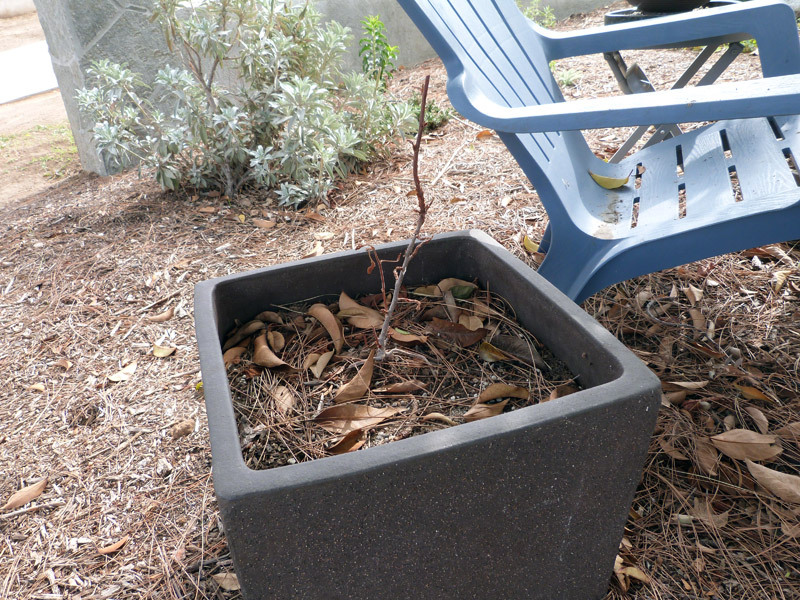 Alas, it looks like my potted Ribes Malveceum (Chaparral Currant) has expired. I am not having good luck with this species! The one on my rear hill also did not make it. Finally, a quick look at the reliable West Side, which continues to click along with few problems. The Lilac Verbena (Verbena lilacina) has increased its blooming (it never completely stopped), and I have to say it is one of my favorite plants. It started to flop over a bit last summer, so I have propped it up here and there with stakes, and it still looks marvelous. It doesn’t present quite as tidy an appearance as it once did, but to me this only adds to its charm. 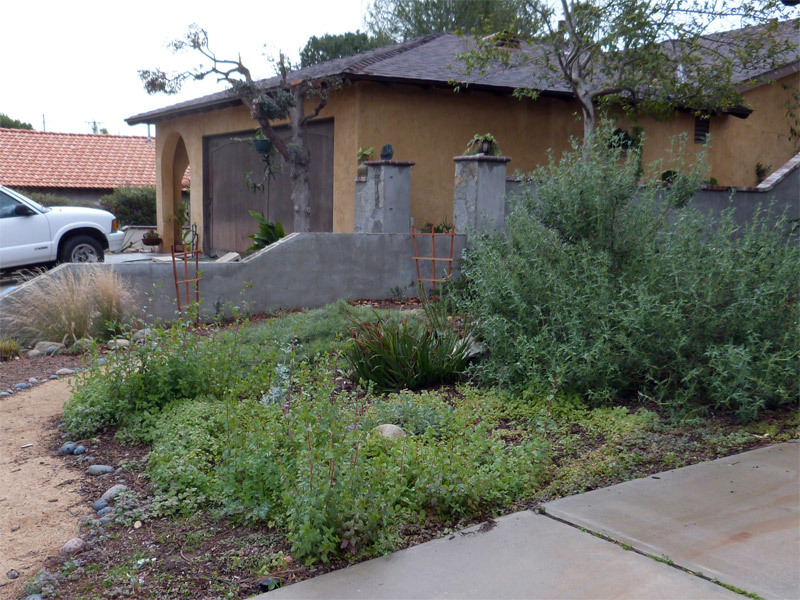 It gives a somewhat riparian look to the area, along with the Coyote Mint (Monardella villosa) and the native grasses next to it. 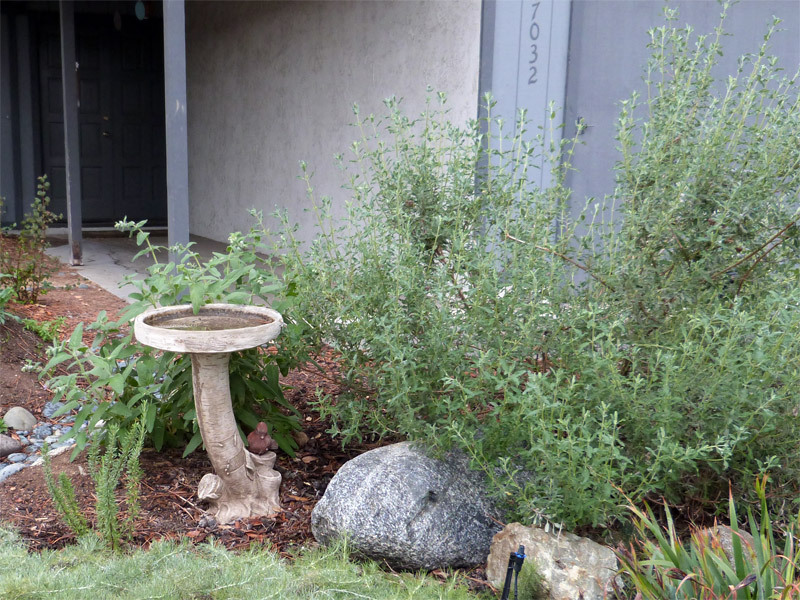 The Cleveland sage to the left of the fountain is growing marvelously. 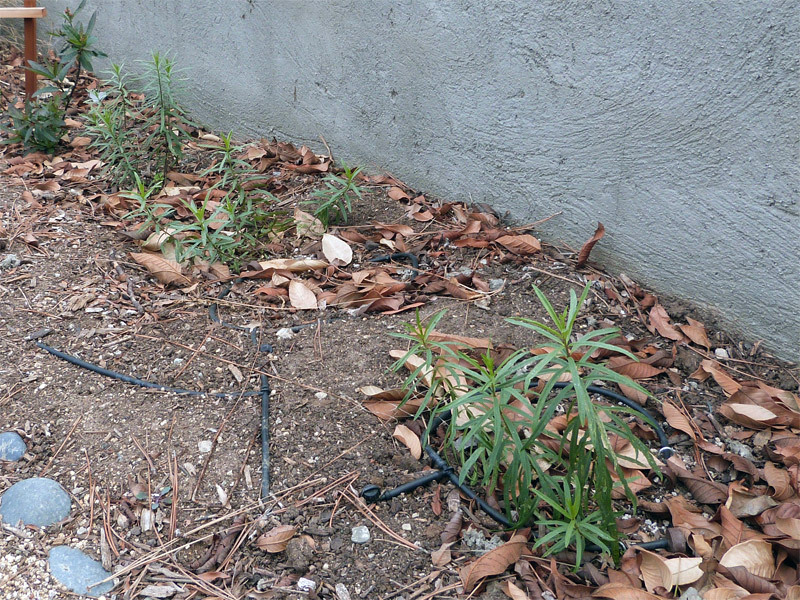 I coppiced the California Fuchsia between the fountain and the Cleveland Sage, and it is starting to grow back. This is not normally a prostrate fuchsia, but I find it has become one over the years — every time I prune it back, it grows back lower. 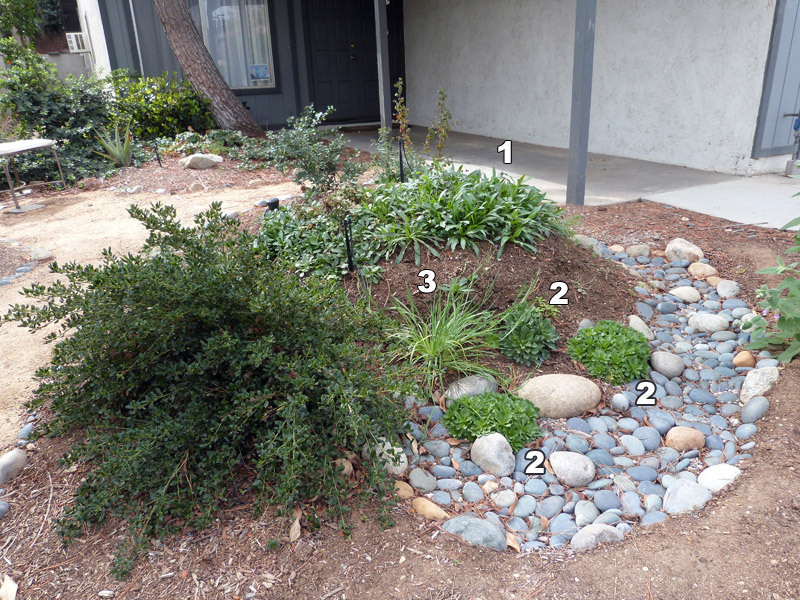 For a gardener concerned with design, this is not a bad thing! That’s it for now — on to spring!